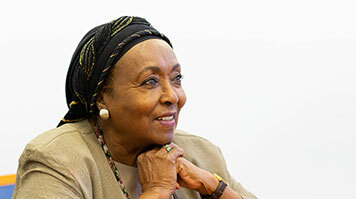 Edna Adan Ismail (Nursing, 1956), who has been awarded an honorary doctorate in the School of Health and Social Care, was the first Somali woman to study in the UK, and the first to work as a qualified nurse. She is also Somaliland’s first female politician, and has built her own teaching hospital and university, with the aim of raising standards of healthcare and education in her homeland. "When I was growing up in British Somaliland, girls didn’t go to school. My parents were both literate, though, and our house was full of books. My father invited the local boys to come and sit on our veranda after school, and hired a tutor to help them with their homework. That’s where I first began to decipher the mysteries of reading and writing. Eventually I was sent to school in Djibouti, in French Somaliland, where my aunt was a teacher. "My mother’s female friends were worried that if I got an education, no one would want to marry me. They couldn’t understand why I wasn’t happy to stay at home and learn to cook like the other girls. I wanted to get educated, and I wanted to run and play and climb trees like the boys. I proved them all wrong in the end, as I did all those things and still ended up marrying the man who had been the president of Somaliland! "From an early age, I worked alongside my father in his hospital. I'd go in and help him during the school holidays, or whenever he needed an extra pair of hands. There were no bandages, so one of my jobs would be to cut sheets into strips, boil them, iron them and roll them up. If he had to go away, he’d leave me notes: make sure they feed this child properly, or remove those sutures. I’d listen to his frustrations too, about the lack of materials and poor facilities. I promised myself that one day I would create the kind of hospital my father would have loved to work in. "I came to London to study pre-nursing at the Borough Polytechnic in 1954. I had a scholarship paid for by the British government. I’d never travelled further than Djibouti before but I’d seen films and pictures of London and knew what it looked like, although the sheer size and number of people came as a surprise. My first home was in digs in Balham. The family had children around my age, and one of the daughters taught me how to ride the buses and get around. I’m still in touch with them today. "Midwifery was not my first choice of specialisation. I really wanted to specialise in surgery. It was the one time I remember my father really questioning one of my decisions. He said, yes, surgery is great. But what are you going to do for the women back home in Somaliland who need you at the most vulnerable time in their lives? And I thought, after all the opportunities I’ve had and the freedom I’ve enjoyed, I should think about giving something back. I did Part 1 and fell in love with midwifery. "There was never any question in my mind that I would come back to Somaliland. I was very clear that the knowledge and experience I was gaining in England was for the benefit of the people here. When I came back, there was a definite air of optimism. The British had left, and Somaliland was independent. Still, the infrastructure was virtually non-existent and no one knew what to do with a female nurse, nor how to pay one – I worked for 22 months without a salary. "Becoming the First Lady gave me an opportunity to be a role model. The assumption was that I would give up working, but I didn’t. Many people thought I was doing a great disservice to my husband, but he was always very supportive. It was around this time – in the late 1960s – that I started training auxiliaries in the hospital to take better care of the women. From there, I started inviting girls who’d been my pupils back when I was a schoolteacher to come in and help me. Their families didn’t want them to get involved with the patients. But slowly, slowly, they began to get interested and excited by the possibilities. Of that first group, five got scholarships to study in England, and three came back to work here. That’s really how nursing in this country got started. "How do you build a hospital in a country with no infrastructure? You just get up and do it. The Edna Adan Maternity Hospital is actually my second hospital – the first, in Mogadishu in neighbouring Somalia, fell into the hands of the warlords during the civil war. The fact that there was no infrastructure, and that so many people doubted me, just made me more determined. I put everything I had into it – all my savings from my years working with WHO, and the proceeds from selling my jewellery and my car – plus donations from the local community and from the diaspora worldwide. I always kept that picture in my mind of the woman who is smelly, who is bleeding, who doesn’t have anywhere else to go. That’s the person I want to help. "I was co-opted into becoming a politician. When I was first asked to become the Minister for Social Affairs, I said no. My hospital had only been open for five months, and I felt like a mother with a new baby. Then the new president got his wife on the case and she used the magic words, remember, you’ll be opening the door for other women. So I agreed to split my time 50/50. There were no buildings, so we turned a floor of the hospital into the Ministry. From there, I went on to become Foreign Minister. "Now we have 200 staff, and I’ve established a university too, with 1500 students. We offer courses in nursing, midwifery, public health, nutrition, veterinary health, pharmacy, laboratory and medicine– it’s very comprehensive. This is my way of helping us develop and keep the talent we so desperately need in the country, and stopping our young people falling prey to human trafficking and terrorism. My next target is teacher training. We need to professionalise teaching here, and make sure our children are getting a proper education. "I was born with a strong desire to fix things. Why should I have downtime? When I need to recharge my batteries, I go out to my family’s camel farms and feed the newborn calves – that’s very therapeutic. But I don’t take much time off." I’m 81 this year, and I don’t have time to waste. There are still so many things I want to do. Holidays can wait.